in the Legislative Assembly of Assiniboia by Hon. André Beauchemin and Hon. Ambroise-Dydime Lépine. 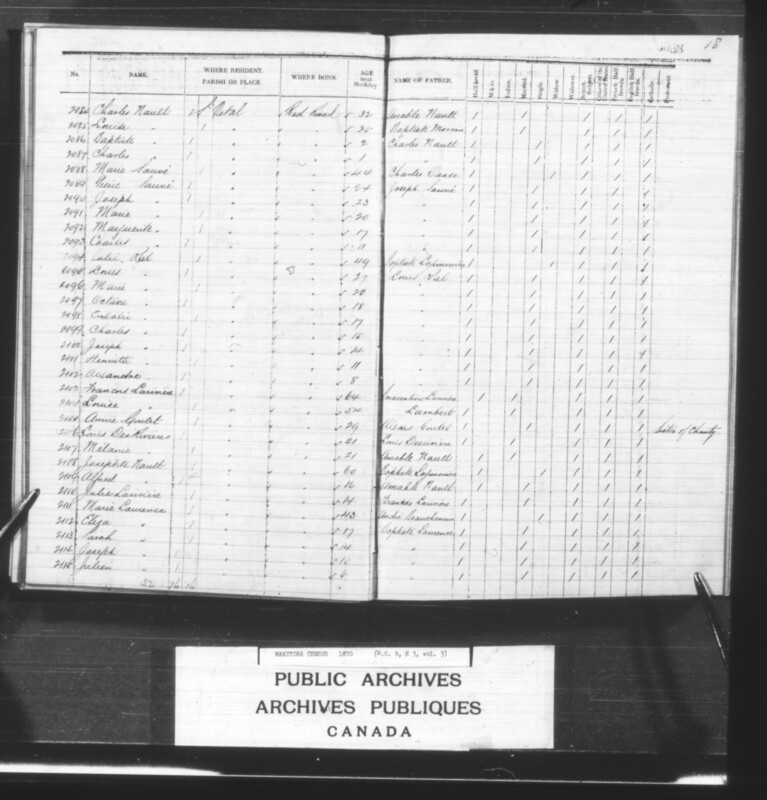 St. Vital was also the home parish of President Louis Riel, Provisional Government of Assiniboia. The parish of St. Vital encompassed properties on both the east and west banks of the Red River in an area initially called Rogaton by Catholic priests — from a French word for leftovers/ scraps, implying the neighbourhood was a small, humble place or peripheral to the parish of the church at St. Boniface. Sixty-four children were enrolled the first year — some of whom had to cross the river on a daily basis to attend. [Possibly] Sr. Christine L’Esperance-Youville (although the photo is apparently dated 1884, which would suggest this is another, younger nun). Sr. Margaret Connolly, photographed later in life (1884). Over the winter, the two sisters prepared a small chapel within the structure, separated from the schoolroom by a folding door. The space allowed the Blessed Sacrament to be kept on site, with “the altar with a small shelf on each side and a prie-Dieu,” and a chair for the bishop and a priest. On 4 April 1861, Taché celebrated the first Mass at the “école-chapelle,” placing the mission under the patronage of St. Vitalis (patron Saint of his Coadjutor Bishop Vital Justin Grandin), even though local residents had asked him to name the mission St. Alexander after Taché’s personal patron saint. Subsequently, Mass was held twice a week. The school eventually became known as Bishop Grandin, St. Vital School/ Grandin School. Within two weeks of opening the chapel, the Red River began to rise [See “1861 flood“]. Floodwater forced the sisters to evacuate the site, but their absence proved temporary and damage was minimal. 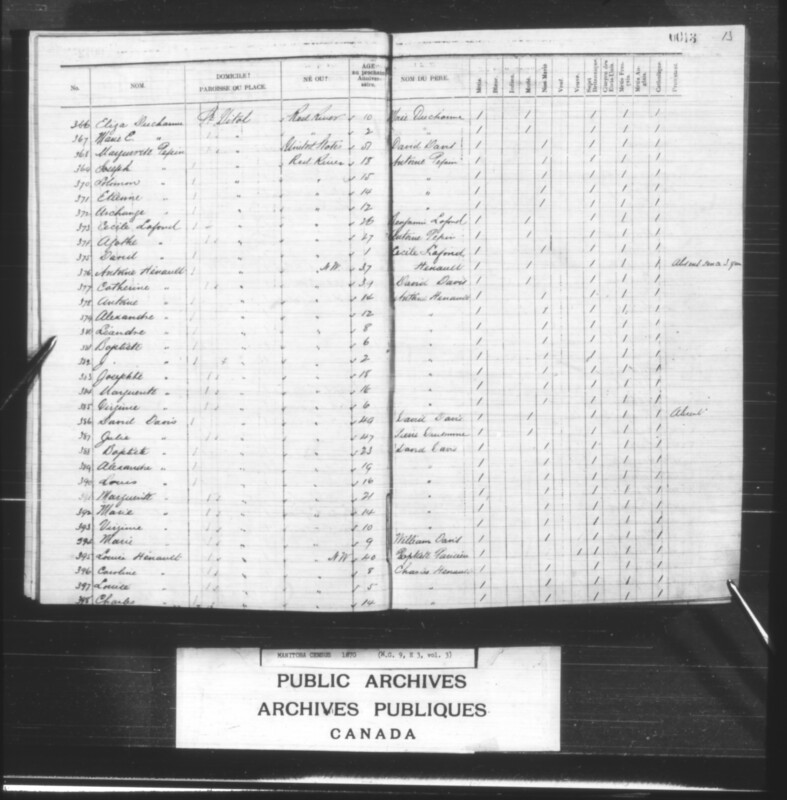 The school and chapel continued to operate — by 1870, with teacher Sister Anne ‘Annie’ Goulét (Métis, born to Alexis Goulét and Josephte Severette; and therefore was a sibling of Elzéar Goulet), followed by Sister Sarah Riel (Métis, born to Louis Riel Sr. and Julie Lagimonière/ Lagemodiere; and therefore was a sibling of President Louis Riel, Provisional Government of Assiniboia). A notable incident — the first overt act of the Red River Resistance — had taken place on the west side of the Red River on 11 October 1869. 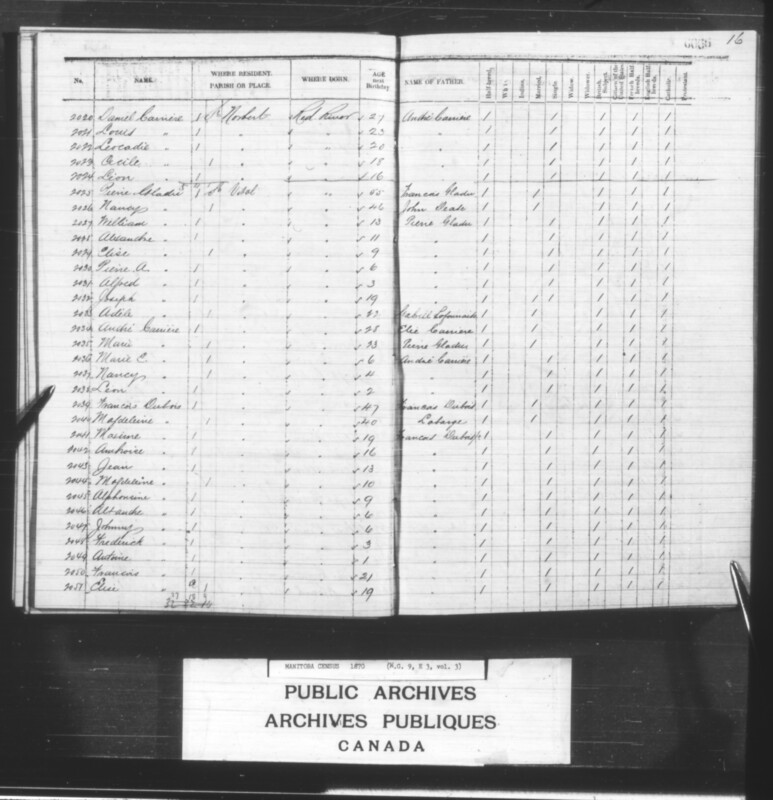 When Canadian surveyors trespassed on the Hay Privilege of André Nault on 11 October 1869, Nault and a number of his relatives, including Louis Riel, put a stop to their activity. See also Bob Holliday, “Marking Our Provincial Beginnings,” Winnipeg Free Press (Posted: 24 July 2013), for an indication of where the incident occurred — now marked by a monument erected by l’union nationale metisse saint joseph du manitoba. Riel House, built by Joseph Riel from 1880 – 1881, sketched in 1886. The R.M. of St. Boniface annexed part of St. Vital in 1880. The school and chapel were closed in 1887 “for no apparent reason.” The Rural Municipality of St. Vital was formed in 1903, “to end confusion with the Town of St. Boniface.” The river did not act as a community divider until the establishment of the R.M. of Fort Garry on the west side of the river in 1912. St. Vital on the east side of the river was incorporated as a city in 1962, then amalgamated with the city of Winnipeg in 1972. –  Modeste 2 (died 1875). 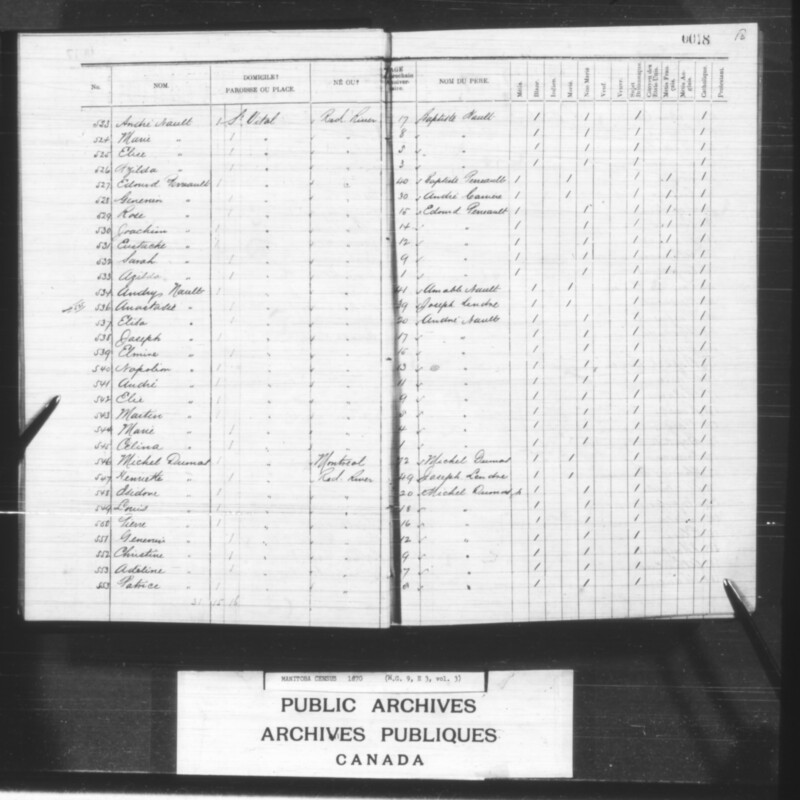 In his affidavit of 1875, Modeste Lagemodiere described himself as a farmer at St. Boniface. – [2158-2159] Louis 6, Cleophace 3. 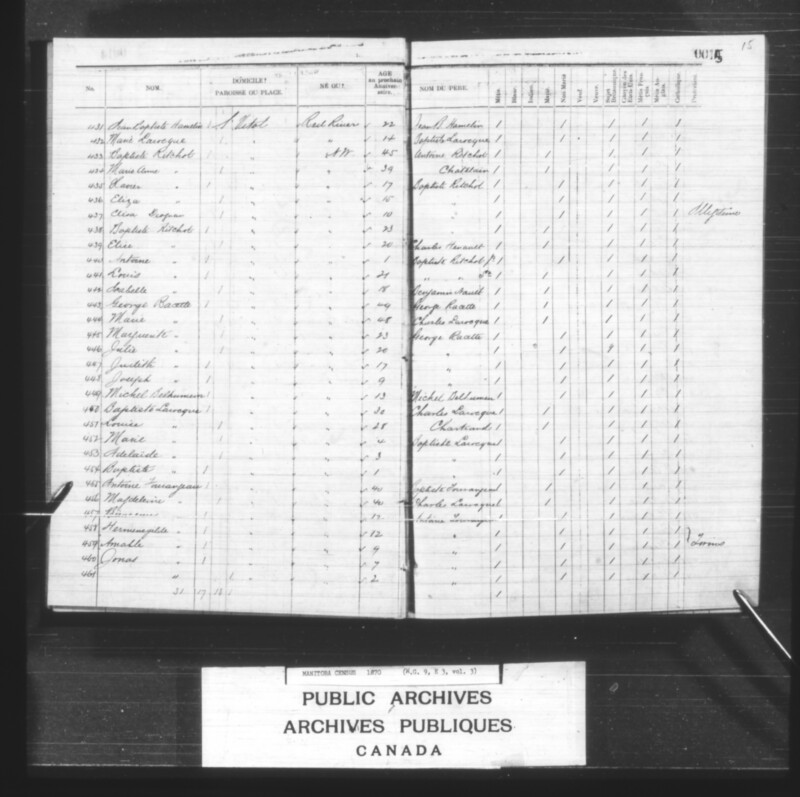 In her affidavit of 1875, Cécile Marion-Lépine described her husband as a farmer at St. Boniface Parish. 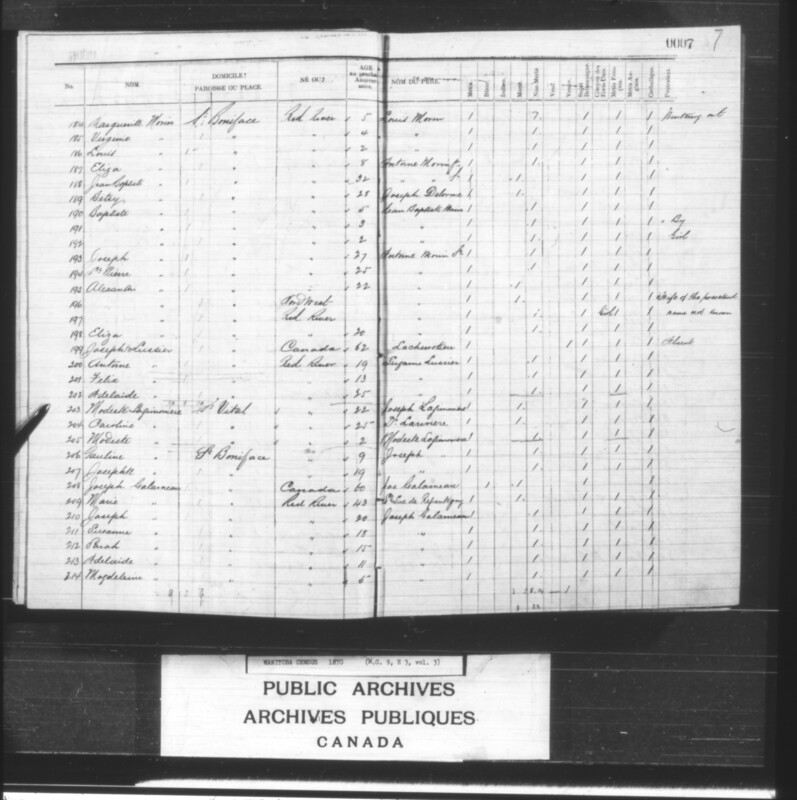 In her affidavit of 1875, on hehalf of Ambroise Lépine (who was at the time imprisoned), she again described him as a farmer of St. Boniface. – [2153-2154] Pierre 6, Virginie 1. 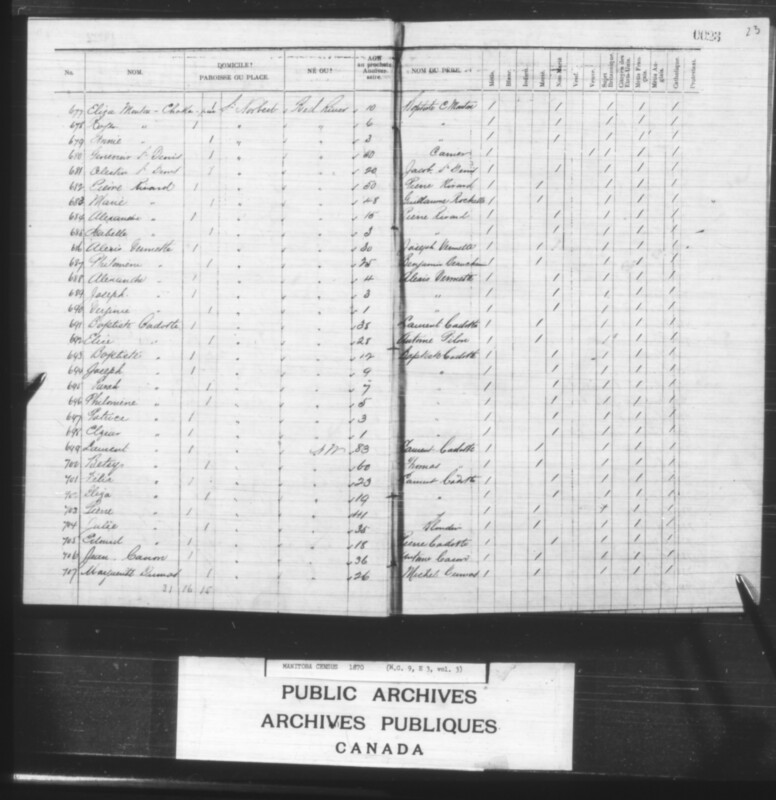 In his affidavit of 1875, Louis Flammand described his place of residence as “Petit Pointe de chêne,” St. Boniface Parish. 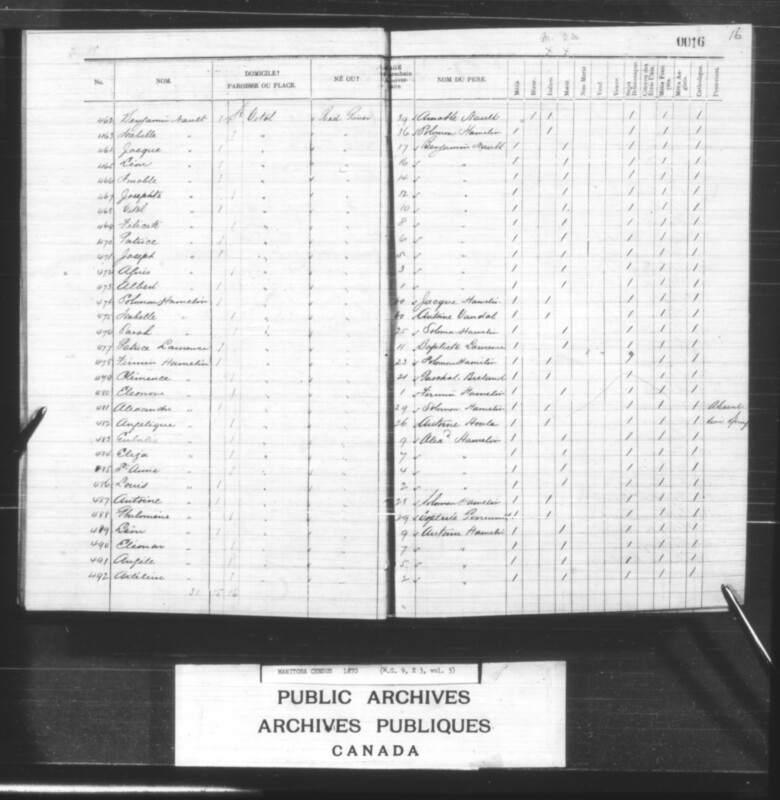 In her affidavit of 1875 Marguerite Bruce-Flammand described her husband as a farmer. – [607-610] Alexandre 10, Marie Joseph Eugenie 8, Joseph 4, Adeline 3. 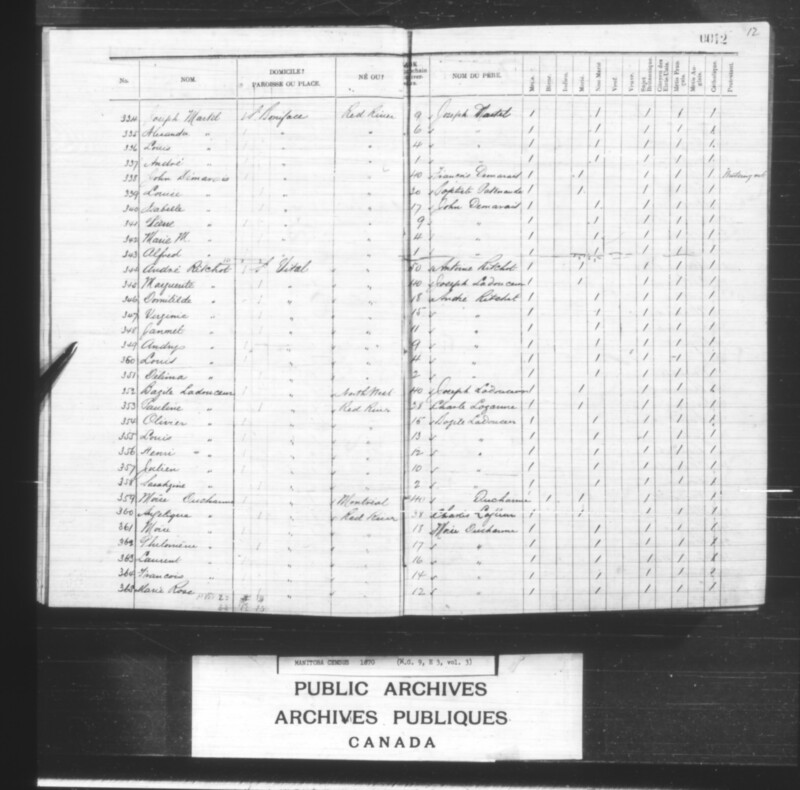 In his affidavit of , Octave Allard was identified as a farmer at St. Boniface. – [593-604] Andre 24, Melanie 22, John 21, Mathais 19, Michel 16, Clara 16, Henri 14, Marguerite 12, Adele 10, Edward 8, Celina 7, Marie 3. – [587-590] Alphonsine 11, Wenceslas 9, Norbert 7, [?] 3. – [579-584] Napoleon 12, Adelaide 10, Elise 8, Marguerite 4, Anathase 3, Marie 1. – [507-517] Amable 21, Emilie 20, Andry 18, Leon 16, Rosalie 15, Melina 13, Helene 11, Louis 9, Octave 5, Modest 3, Guillaume 1. – [572-576] Melanie 10, Rosalie 7, Marguerite 6, Baptiste 4, Francois 1. – [567-569] Marguerite 4, Alexandre 3, Joseph 1. – [556-564] Mathilde 22, Dumas 19, Louis 17, Eulalie 13, Napoleon 12, Bruno 10, Marguerite 7, Athanase 5, Angelique 2. – [548-553] Isadore 20, Louis 18, Pierre 16, Genevieve 12, Christine 9, Adeline 7, Patrice 5. – [537-545] Elisa 20, Joseph 17, Elmine 15, Napoleon 13, Andre 11, Elie 9, Martin 5, Marie 4, Celina 1. – [529-533] Rose 15, Joachim 14, Eustache 12, Sarah 9, Azilda 1. – Prosper 21, Godfroy 20, [523-526] Andre 17, Marie 8, Elise 5, Azilda 3. – [503-504] Alexandre 6, Edward 4. – [445-448] Marguerite 23, Julie 20, Judith 17, Joseph 9. –  Michel Belhumeur 13 (son of Michel Belhumeur and an unidentified woman). – [457-461] Bienaeme 12, Hermenegilde 12, Amable 9, Jonas 7, [?] 2. – [452-454] Marie 4, Adelaide 3, Baptiste 1. – [483-486] Eulalie 9, Eliza 7, St Anne 4, Louis 2. – [495-497] Solomon 10, Virginie 11, Melina 4. – [489-492] Leon 9, Eleonore 7, Angele 5, Adeleine 2. 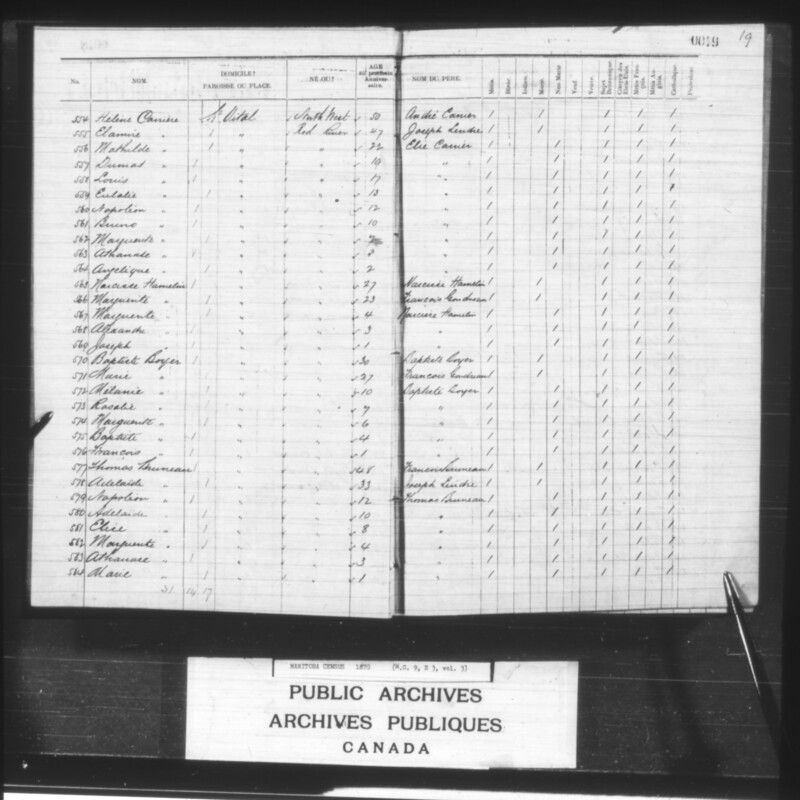 –  Patrice 11 (Métis, son of Baptiste Laurence). – [416-418] Marie 6, Joseph 4, John 1. – [369-372] Joseph 18, Solomon 15, Etienne 14, Archange 12. – [420-422] Joachim 17, Leon 14, Josephte 11. –  Jean-Baptiste 22, married? Marie Larocque 14 (daughter of Baptiste Larocque and an unidentified woman). – [425-427] Eleonor 6, Nancy 4, Marguerite 3. – [464-473] Jacque 17, Leon 16, Amable 14, Josephte 12, Vital 10, Felicite 8, Patrice 6, Joseph 5, Agnes 3, Albert 1. – [405-410] Elise 20, Charles 17, Marguerite 14, Pierre 12, Napoleon 9, Francois 5. –  Charles 14,  Judith 13,  Isabelle 12,  Caroline 8,  Pierre 6,  Louise 5,  William 2. 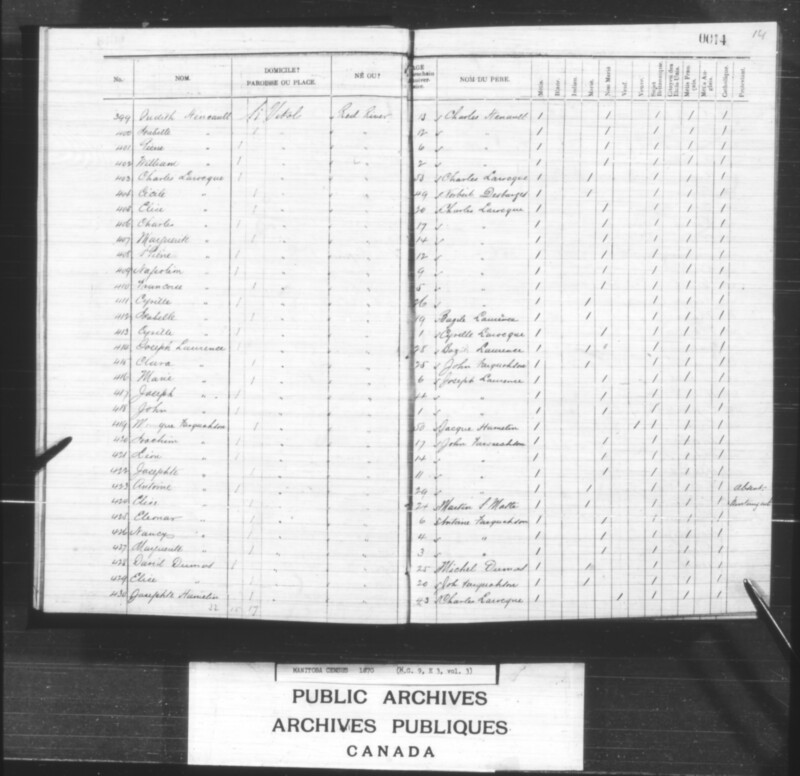 See genealogy; query; ‘Canada’ surname description. – [388-393] Jean-Baptiste 23, Marguerite 21, Alexandre 19, Louis 16, Marie 14, Virginie 10. –  Marie 9 (daughter of William Davis and an unidentified woman). – [378-385] Josephte 18, Marguerite 16, Antoine 14, Alexandre 12, Leandre 8, Jean-Baptiste 6, Virginie 6, J. 2. – [435-437] Xavier 17, Eliza 15, Elisa Geofman? 10. – [361-365] Moise 18, Philomene 17, Laurent 16, Francois 14, Marie Rose 12, [366-367] Eliza 10, Marie E. 2. – [354-358] Olivier 15, Louis 13, Henri 12, Julien 10, Sasahzine 2. – [346-351] Domitilde 18, Virginie 15, Jannet 11, Andry 9, Louis 4, Delima 2. – [2148-2150] Cecile 18, Clemence 17, Jean-Baptiste 11. – [2140-2145] Leon 23, Andre 18, Faiselle 11, Marie Vitalieu/ Vitaline 8, Adelaide 5, Alexandre 3. – [2133-2137] Philomene 10, Norbert 6, Denise 4, William 2. – [2127-2131] Virginie 10, Melanie 8, Joseph 5, Andre 4, Martin 1. – [2122-2124] Reine 18, Marie Rose 16, Melanie 8. – [2118-2119] Marie R. 3, Patrice 1. – [2112-2115] Eliza 17, Sarah 14, Joseph 10, Julien 6. – [2089-2093] Pierre 24, Joseph 23, Marie 20, Marguerite 17, Charles 11. 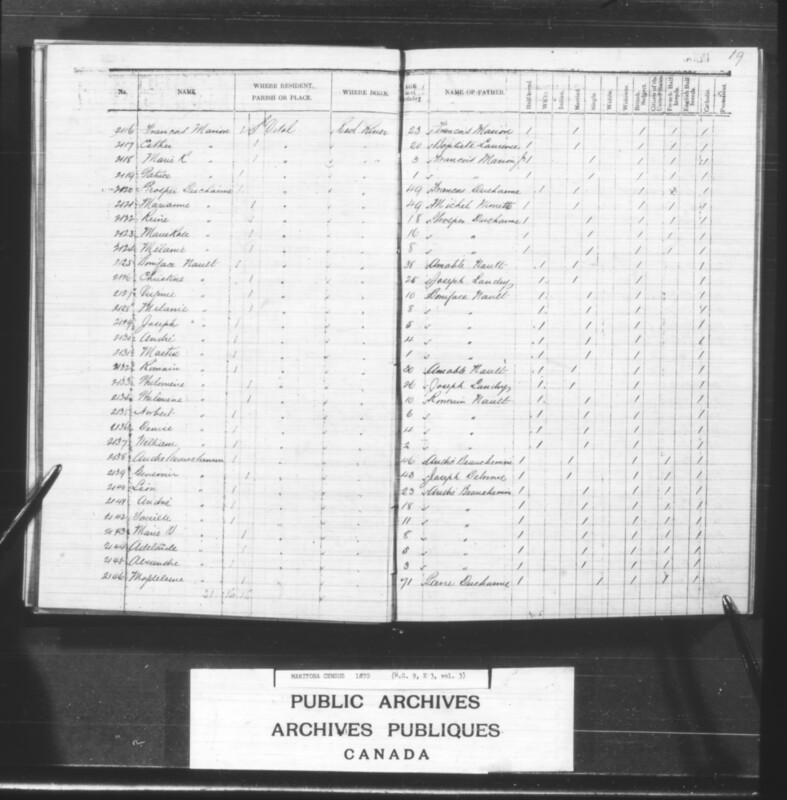 – [2098-2102] [President] Louis [Riel, Provisional Government of Assiniboia] 27, Marie 20, Octavie 18, Eulalie 17, Charles 15, Joseph 14, Henriette 11, Alexandre 8. – [2086-2087] Jean-Baptiste 2, Charles 1. – [2080-2083] Elzear 7, Joseph 6, Fresine 3, Alexandre 1. – [2073-2076] Marie 8, Joseph 6, Eliza 5, William 2. – [2068-2070] Marie 18, Olivier 14, Etienne 2. – [2060-2063] Pierre 22, Monique 17, Solomon 15, Rosalie 12. – [2055-2057] Roger 13, Francois 10, Isadore [?]. – [2041-2051] Francois 21, Elise 19, Maxime 19, Ambroise 16, Jean 13, Magdeleine 10, Alphonsine 9, Alexandre 6, Johnny 6, Frederick 3, Antoine 1. – [2036-2038] Marie E. 6, Nancy 4, Leon 2. – [2027-2031] William 13, Alexandre 11, Elise 9, Pierre A. 6, Alfred 3. Thank you so much for printing this out! In a divorce he has my hard worked on genealogy. You have filled some gaps! Very much appreciated. 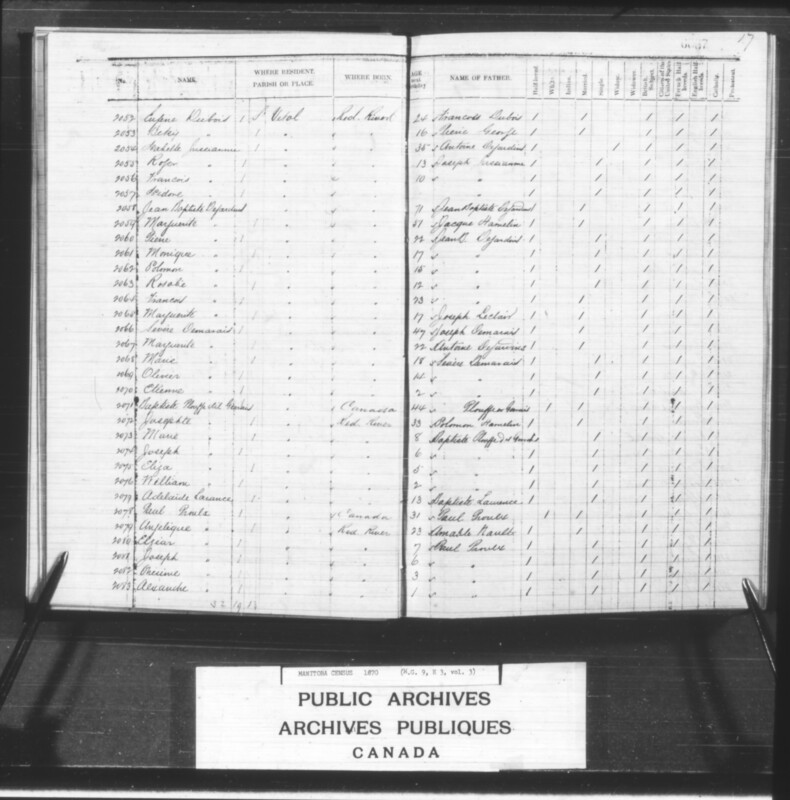 Do you provide genealogy assistance (or know of anyone who does)? 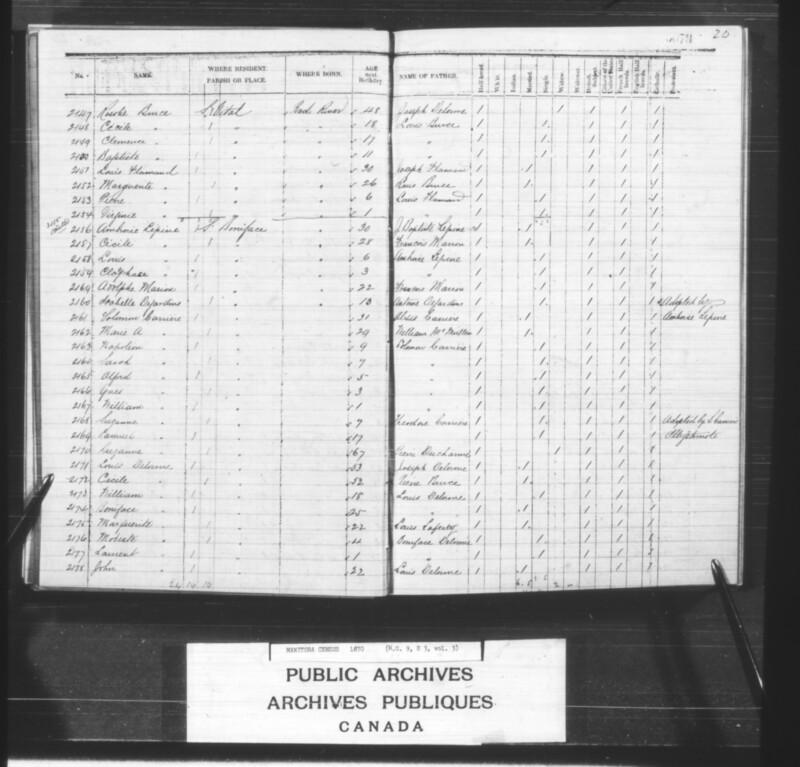 My family is Plouff, and I have Carriere relatives from Red River and Desjardins relatives. That’s all I know as far as my connection to Red River. Thanks! 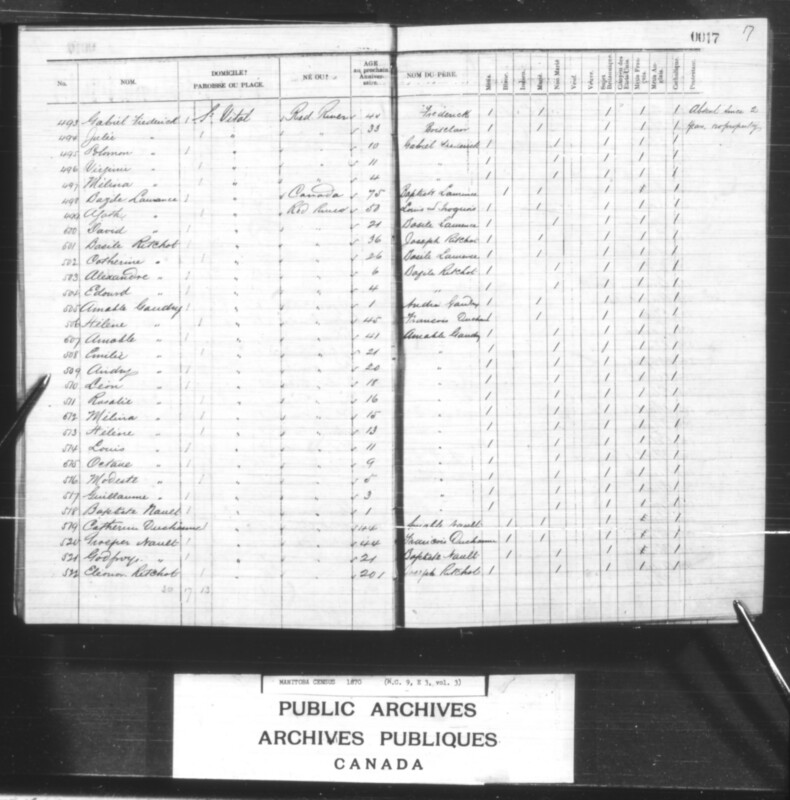 You could visit the Archives of Manitoba to view maps of the settlement and see where Gladu properties were recorded over time. 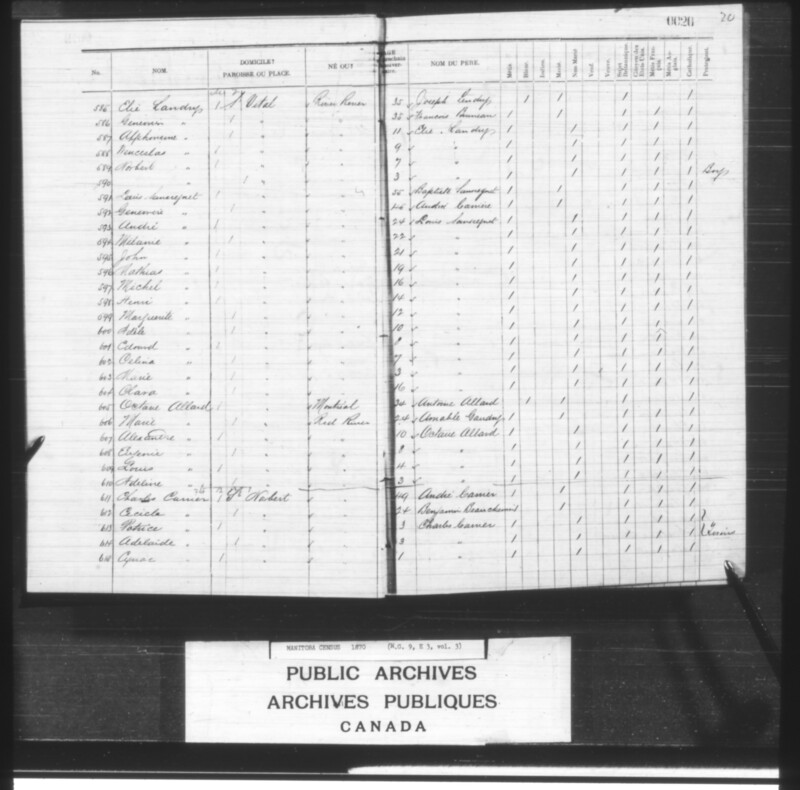 Or, there is a map online that shows Pierre Gladu’s property as of 1871 at https://www.flickr.com/photos/manitobamaps/2187411701 (download it at its original size to read it). According to that map Pierre appears to have owned a sizable chunk of land relative to other settlers. The property takes up most of a big river bend. Comparing the old map of the river bends to a modern one might allow you to pinpoint where the property sits today.